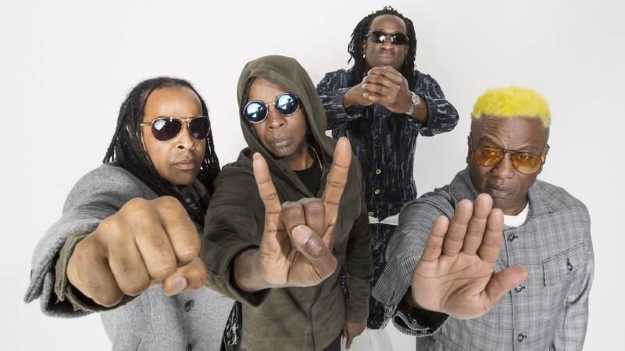 Living Colour's Shade comes out Sept. 8. I sometimes wake up with my jaw clenched. The times are tense and we all feel it. I've been waiting for just the right musical statement to reflect my mood, my hopes and my mal humor. I think I've finally heard it in Living Colour's upcoming album Shade. On "Come On," vocalist Corey Glover, drummer Will Calhoun, bassist Doug Wimbish and guitarist Vernon Reid once again deliver passion, thoughtfulness and poetry with crunchy guitars and seriously funky deep bass/drum grooves. Years ago, an astute writer once described Reid's solos as "the sound of glass breaking" and the observation still stands, only now it is propelled by over 30 years of playing with bandmates who can read each other's thoughts and emotions. One of these mornings, I'll have the strength to tell you how I feel, Won't be afraid of what's being said, See, I won't scrape or kneel. "To me, there seems to be a shadow cast across our collective lives," Reid writes in a press release, reflecting not just on the band but on where many fans' minds reside these days. "We can either allow it to oppress us or we can shine a light on it. Shade is the sound of a band coming to terms with the shadows and shining a light by using the blues as a mirror." Shade comes out Sept. 8 via Megaforce Records.